IndustriALL Global Union Signs Worldwide Social and Environmental Responsibility Agreement with Solvay – December 17, 2013: Today, IndustriALL Global Union and chemical group Solvay signed a social and environmental responsibility agreement. With the agreement Solvay commits to respect international social standards as defined by the International Labor Organization (ILO). Agreement Ends SL Garment Strike in Cambodia – December 19, 2013: IndustriALL affiliate C.CAWDU and SL Garment Processing sign an agreement to end a three-month long strike in Cambodia, including the re-hiring of 19 dismissed union representatives, payment of half of the lost wages and the removal of a newly appointed manager. African Development Bank Adopts Labour Safeguards – December 13, 2013: The African Development Bank (AfDB) has determined that all its borrowers must comply with ILO core labour standards and other requirements protecting workers. 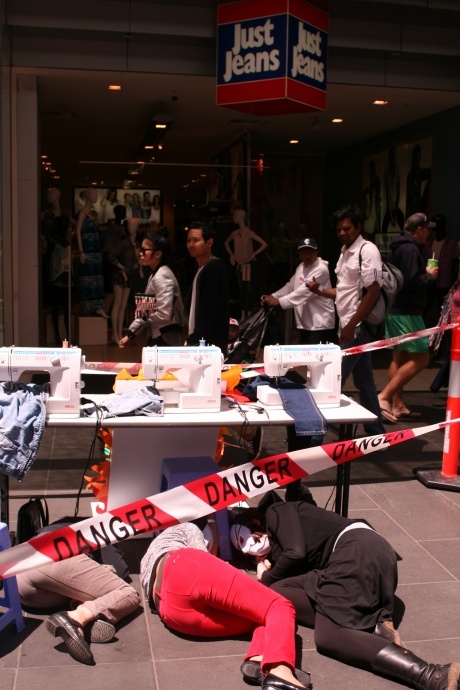 JUST GROUP – “Just Sign It” – December 19, 2013: Some Australian companies are yet to sign the Bangladesh Accord and continue to profit from workers’ misery and hide behind sham commitments. Join the Australian unions’ online campaign for Just Group to sign the Accord here and write to CEO Mark McInnes. Final Call Before Christmas for Swiss Supermarkets to Sign Accord – December 16, 2013: Global labour leaders have come together in Switzerland to demand that supermarket chains Migros and Coop sign the Bangladesh Accord on Fire and Building Safety before Christmas. December 17, 2013: Today, IndustriALL Global Union and chemical group Solvay signed a social and environmental responsibility agreement. With the agreement Solvay commits to respect international social standards as defined by the International Labor Organization (ILO). 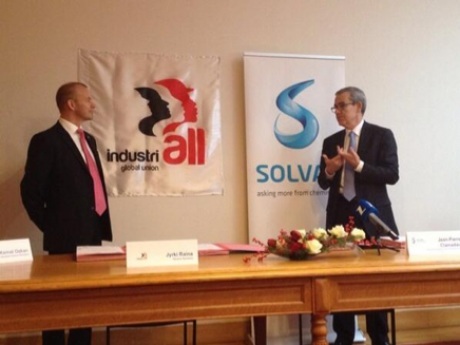 The official signing ceremony took place on 17 December in the presence of Jyrki Raina, General Secretary of IndustriALL, and Jean-Pierre Clamadieu, CEO of Solvay. At the ceremony, Albert Kruft as Secretary of Solvay’s European Works Council, also pledged full support to this global agreement. Solvay commits to respect international social standards as defined by the International Labor Organization and to comply with the principles of the United Nations Global Compact in all of its operations worldwide – also in countries which have not yet ratified these conventions. Solvay expects its suppliers and sub-contractors to respect these fundamental principles. Every year, two joint assessment missions will take place in countries and on sites chosen by IndustriALL, along with IndustriALL officers, Solvay management and trade union representatives. The first mission assesses Solvay’s safety policies and the second mission will review the application of all the agreement’s aspects, including environmental protection, pay levels or relationships with suppliers and subcontractors. “This agreement reflects our aim to foster a rich and well-balanced dialogue with the Group’s employees and their representatives worldwide. IndustriALL will be a demanding and constructive partner in helping us to implement this agreement,” said Jean-Pierre Clamadieu, CEO of Solvay. December 19, 2013: IndustriALL affiliate C.CAWDU and SL Garment Processing sign an agreement to end a three-month long strike in Cambodia, including the re-hiring of 19 dismissed union representatives, payment of half of the lost wages and the removal of a newly appointed manager. After more than five months of dispute, including strikes that were violently repressed by the police, SL Garment Processing and C.CAWDU reached an agreement in early December. The agreement facilitated by the Ministry of Labour stipulates the reinstatement of 19 fired union leaders, in addition to 90% of workers who have returned to work. The company agreed to pay to the workers 50 percent of the wages lost during the strike, totalling a million USD. All lawsuits against CCAWDU will be dropped. Shareholder Meas Sothas who hired military police to attack workers will be taken off all operational management duties. The ministry formed a committee of government, labor and industry officials to oversee the agreement’s implementation. The implementation of the agreement, notably the payment of the back wages still need careful monitoring from the Ministry of Labour and IndustriALL. Continued dialogue between the union and the management is also needed on working conditions in the factory that sparked the strike. IndustriALL, with the support of buyers such as H&M, Inditex and GAP, is committed to ensuring that this dialogue takes place and industrial relations are strengthened to prevent a similar crisis. December 13, 2013: The African Development Bank (AfDB) has determined that all its borrowers must comply with ILO core labour standards and other requirements protecting workers. In adopting “Operational Safeguard 5: Labour Conditions, Health and Safety” (OS 5), the AfDB requires that all bank borrowers comply with the ILO core labour standards, provide written information to workers about their working conditions and rights, comply with basic occupational health and safety standards, and take responsibility for the conditions of “third-party” (subcontracted) workers. The adoption of the new safeguards culminates a four-year process to which trade unions contributed recommendations. It follows the example of the labour performance requirements adopted in 2006 by the World Bank’s private sector lending are, the IFC. While largely similar, the AfDB policy appears to put a stronger requirement on borrowers to ensure that its contractors also comply, instructing that “the borrower or client incorporates these requirements [of OS 5] in contractual agreements with its contractors, subcontractors and intermediaries”. The IFC requires only that borrowers ‘use commercially reasonable efforts’. The AfDB has announced that it will develop assessment procedures and a tracking system to enable it to monitor implementation of the new requirements. Jenny Holdcroft, policy director at IndustriALL Global Union, says that monitoring by trade unions has played an important role in ensuring compliance with the IFC labour safeguards. Two other major regional development banks — the Asian Development Bank and the Inter-American Development Bank — have so far taken no action to adopt a labour safeguard. December 19, 2013: Some Australian companies are yet to sign the Bangladesh Accord and continue to profit from workers’ misery and hide behind sham commitments. Join the Australian unions’ online campaign for Just Group to sign the Accord here and write to CEO Mark McInnes. 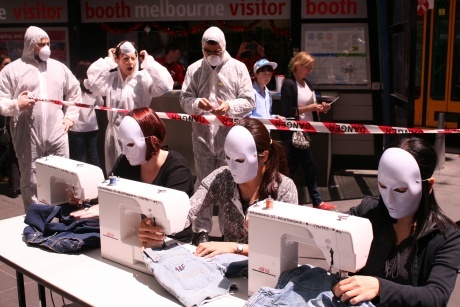 On Saturday 14 December 2013 unions, community groups and members of the public held a protest in front of the Just Jeans store in Bourke Street, Melbourne urging the Just Group to do the right thing and sign onto the Accord. Bucking the trend for Australian retailers, the Just Group, whose brands include Just Jeans, Jay Jays, Jacqui E, Dotti, Peter Alexander and Portmans have not signed onto the Accord. Instead they have joined with Walmart, a world leader in violating its workers’ rights, in signing a cynical, non-legally binding cop out called the “Alliance for Bangladesh worker Safety”. 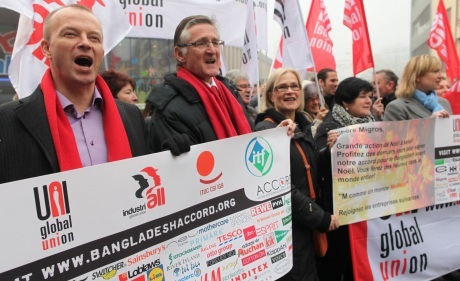 December 16, 2013: Global labour leaders have come together in Switzerland to demand that supermarket chains Migros and Coop sign the Bangladesh Accord on Fire and Building Safety before Christmas. More than 120 global brands have signed the Accord, a legally binding document which aims to bring safety and sustainability to the Bangladeshi garment sector following a string of deadly tragedies. But the two Swiss commerce giants have so far refused to add their name to a list that includes a number of global supermarket brands. In April more than 1,100 garment workers died when the Rana Plaza factory complex collapsed near the capital Dhaka. The disaster led IndustriALL and UNI to establish the Accord on Fire and Building Safety, which now covers over 1800 factories and more than 2 million workers. Jyrki Raina and Philip Jennings, the leaders of IndustriALL and UNI Global Union respectively, were joined by ITUC General Secretary Sharan Burrow at a protest outside a Migros store in Nyon. “We are eight days from Christmas but it has been eight months since a tragedy that caused the deaths of over a thousand people in Bangladesh,” Jennings said. ITUC Secretary General Sharan Burrow said, “The CEOs of a host of major global brands have added their name to this agreement, which is making a huge difference to factory safety in Bangladesh. In letters to the CEO’s of both Migros and Coop, Jennings and Raina said, “We are writing to ask you to join more than 120 global brands in an unprecedented movement to improve working and safety conditions for garment workers in Bangladesh, from which your independent organisations source a number of products.